This plain, green covered book has exactly the same content as my paperback version except that it is a pdf eBook. You can download it on any iPad or on your computer. Basics of Prayer is Book One of my six book series on prayer. The other book titles are: Purpose of Prayer, Principles of Prayer, Joy of Prayer, Service of Prayer, and Zenith of Prayer. As you can see from the outline, Basics of Prayer gives you the very foundational elements of prayer. 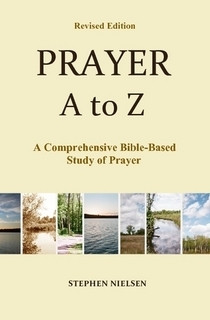 If you are looking for a thorough, reflective, yet easy-to-read study of prayer you will enjoy this book. Why Should We Be Concerned about our Prayer Posture? What Do We Yield To? Prayer is soul to soul communication with God. So far we have said that prayer is petition. And we said that there are basically three types of petitions: (1) invocation, or asking God to be God to us and to help us commune with Him; (2) asking God for the basic things we need; and (3) intercession. Now we are saying that prayer is not only petition, it is also something more basic—it is soul to soul communication with God. And this really must come first, before we ask God for anything. For this is the heart of prayer. Before we can expect Him to listen to our requests we must have made contact with His soul by our soul. So I am suggesting that “coming into contact with God” with our souls is really what prayer is. True prayer, therefore, will involves the mind, the affections (the heart or the emotions), and the will (that part of us that makes choices). Secondly, to engage our soul with the soul of God we must exercise our emotions (or our heart) toward God in communion. How do we do this? Well, our meditation on the word is how we start. It will open the door to heart to heart communion. When we study and meditate on His Word He speaks to us and then we listen. The third part of the soul is the will. With the will we make choices; we choose to obey God or not. The exercise of this part of the soul is vitally important. Our listening to God and choosing to obey Him keeps the door of our soul open to His soul; it keeps our soul in contact and communication with Him. Accordingly, our willful obedience is the key to bringing life to our soul. For by it we receive His love and power (Jn. 14:21). Without obedience our prayers drop dead; but with obedience our prayers come alive and are continually energized by His life. It’s very easy. Just click on the image of the green book in this blog post. That will take you to Stephen’s Book Store, and you will see all my books. Feel free to browse around. To get this free book just click on “Add to Cart” under the green book (Basics of Prayer) that is listed as $0.00. Then go through the process of getting the book just as if you were buying it, except it is free. After you click on “Add to Cart,” next click on “Continue to check out” at the bottom of the page. After that page comes up, then click on “Place Order.” You will then see some processing going on, and a sign will come up that says “Download (pdf).” Click on that sign and it will be downloaded to your computer. From there I think you know what to do. This entry was posted in About Basics of Prayer and tagged Basics of Prayer, book on prayer, definition of prayer, Fasting, how to pray, intercession, learning to pray, meaning of prayer, prayer, prayer posture. Bookmark the permalink. Jesus is always near you Safaa. Just pour out your heart to Him and He will hear you. If you don’t feel His nearness, I would suggest reading more of the word of God. The word is God’s words to us.